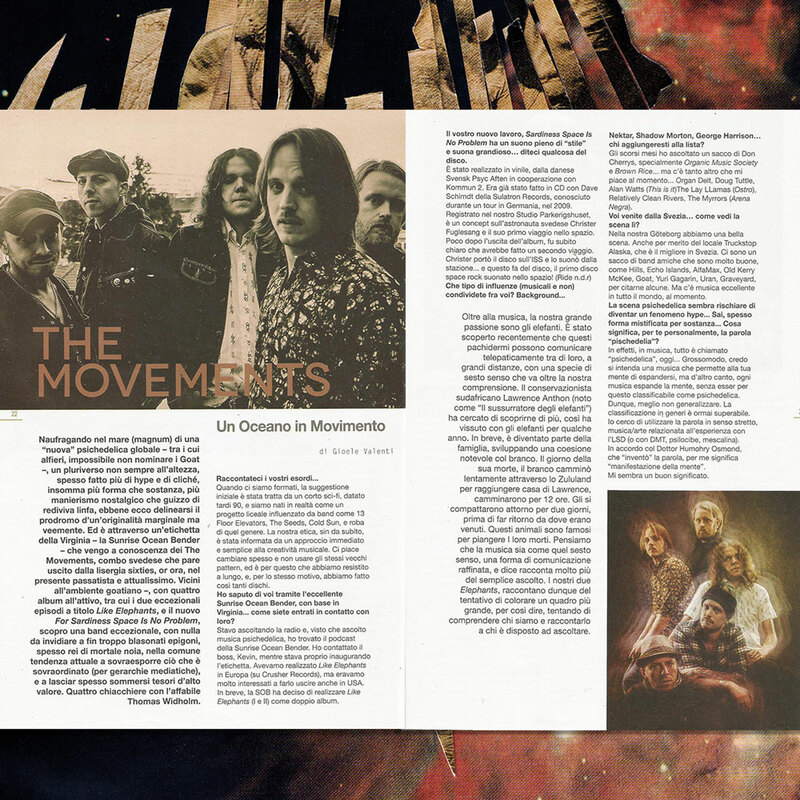 Big thanks to our man Gioele and Rockerilla Mag in Italy for shining a light on The Movements and SOB … dig a great read with Thomas from The Movements. Thanks to Thomas for helping with my own language and a dubious translation. Tell us how you guys got together. When The Movements was formed the name was taken from a short sci-fi movie made by Dolly in the late 90s as a high school project and the influences in the beginning was mainly 13 Floor Elevators, The Seeds, Cold Sun, and stuff like that. Our ethos has always been from the start to have a non complicated and free approach to music and creativity. We strive for developing and changing. We don’t like to get stuck in old patterns and that is what has made us exist for this long and the reason that we have made lots of records. I knew your music through the terrific Sunrise Ocean Bender… How did you get in touch with them? I use to listen to radio when I’m at work and since I’m into psychedelic music, I found Sunrise Ocean Bender’s podcast. I used to have contact with Kevin through email even before they started up the record label. And when we released the Like Elephants records in Europe (on Crusher Records) we also looked for someone to release them in the US. And around that time Kevin told me that SOB where about to start a record label, and told us that they wanted to release ‘Like Elephants 1 & 2’ as a double album. For ‘Sardines Space Is No Problem’ is totally stylish and great… tell us something about it. It’s just released on vinyl, by Danish record label called Svensk Psych Aften in co-operation with Kommun 2. The album was first released on cd by Sulatron records back in 2009. ”During a tour in Germany we became friends with Dave Schimdt from Sulatron Records. He asked us if we wanted to record a spacerock album for his record label. We thought it wasa good idea. The album is recorded in our own Studio Parkerigshuset. The album is a concept album about Swedish astronaut Christer Fuglesang and his first trip to space. Shortly after the album was released, it became clear that Christer Fuglesang would go up on a second flight to space. Christer brought the album and played it in Space at Space station ISS which made it the first space rock album actually played in space! Except for music our biggest influence are elephants. Recent years there have been found out that elephants have a way to communicate with some kind of telepathy. They can communicate with each other over long distances with some kind of sixth sense which goes beyond our understanding. South African conservationist Lawrence Anthon (known as “The elephant whisperer”) tried to found out more about this so he lived with some elephants for some years. The elephants and Lawrence developed a bond and he became a part of their family. The day he died, two herds of wild South African elephants slowly made their way through the Zululand bush until they reached his house, they walked for 12 hours to get there. They all hung around for about two days before making their way back into the bush. Elephants are known to mourn their dead. We think that music is like that sixth sense, a different way to communicate with each other. Sometimes it works much better than all other forms of communication and tells a lot more about a person playing or a person listening. Our albums ‘Like Elephants 1 & 2’ are about how we can sometimes glimpse that spiritual communication but we seem to have a problem opening up fully to it. To get the whole picture you can say. With these albums we hope the ones listening to the albums will reach some kind of deeper understanding of who we are , if they are interested. Your work sounds pleasantly vintage, was it a choice or it comes spontaneously? We are not interested to sound vintage for the sake of sound vintage or retro. We try to do music that sounds good 2015 but of course on the other hand we want a warm and nice sound. We just record it in a way that we think sounds good. Nektar, Shadow Morton, George Harrison… who would you add to the list? Favourite bands around at the moment? Last few months I listened a lot to Don Cherry’s 70s records especially ‘Organic Music Society’ and ‘Brown Rice’. You come from Sweden… how do you see the scene there? In our hometown Göteborg we have a pretty good music scene. Much because of the venue Truckstop Alaska which easily are the best venue in Sweden. There are a lot of our friends bands that are really good at the moment Hills, Echo Island, AlfaMax, Old Kerry McKee, Den stora vilan, Jacques Labouchere, Ruins, Slowgold, Spjärnsvallet, Uran, Graveyard, Yuri gagarin, Goat, to name a few. It is clearly a lot of interesting music happening in Sweden but I really believe there islot of interesting music in other placesas well. Psychedelic scene seems to risk to be the new hype phenomena… You know, sometimes shape mystified for substance… What it means the word “psychedelic” in your personal opinion? I don’t really know how the word psychedelic is used anymore, it seems like all music is called psychedelic these days.. Psychedelia refers in some way to music that will expand your mind, on the other hand nearly all kind of music can expand your mind in some way.Maybe it is not necessary to think so much about genres nowadays, everything is mixed up. Genres feels old fashioned. I try to use the word in a more strict way, I use it about music/art related to the LSD experience. (or compareable hallucinogens such as DMT, psilocybin, mescaline). According to Dr Humohry Osmond who “invented” the word it means “mind manifesting”, so I guess that is what psychedelic means.